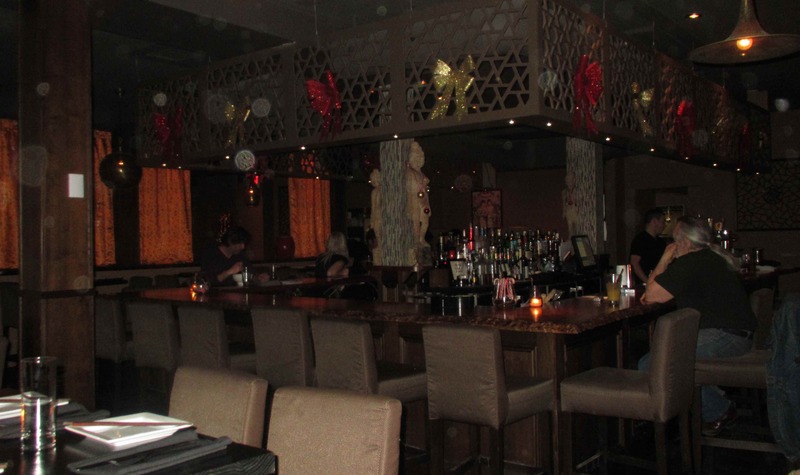 The first thing that struck me about Izakaya is that it maintained the same layout as Big Daddy’s, being divided into two areas with a smaller, more intimate side and then a larger area with a big horse-shoe shaped bar. Funnily enough, however, Izakaya seems quite a bit smaller than its predecessor, although the floor space is about equal as far as I can tell. Probably, this results from the fact that the décor features a lot of dark wood and the lighting is very muted, giving the place a much more cozy feel. I arrived at about 7pm on a Sunday evening and the place, which would seat about 80 or so, had about a dozen patrons present initially. This increased to about double that number at one point during my visit and, until about 9pm, the staff consisted of a single bartender who also did double duty of serving tables. In the main, the service was very efficient and friendly, although I thought that the actual delivery of the various dishes I ordered was a bit slow given the light crowd that evening. I actually didn’t mind this too much as I prefer a relaxed pace, but for those who drop in for a bite before going elsewhere, I could see that the bottleneck in the kitchen could be a bit of an annoyance. Pow Pow Sauce – A fiery hot pepper relish. A bit much for Oysters, maybe. As for the oysters I was very glad I tried them as they were absolutely top notch. They were very plump and firm, being possibly the best textured oysters I have ever had and the fresh sweetness was amazing. They weren’t quite as sharply briny a you usually get from PEI oysters but there were lovely sandy and woody notes and a rich sweet cucumber quality that began as just a few highlights and then came to dominate the finish. I gave this selection a well-deserved 5 out of 5. Kimchi – This dish was definitely not one of the more traditional Korean cabbage pickles that are fermented for a long period with lots of umami ingredients. 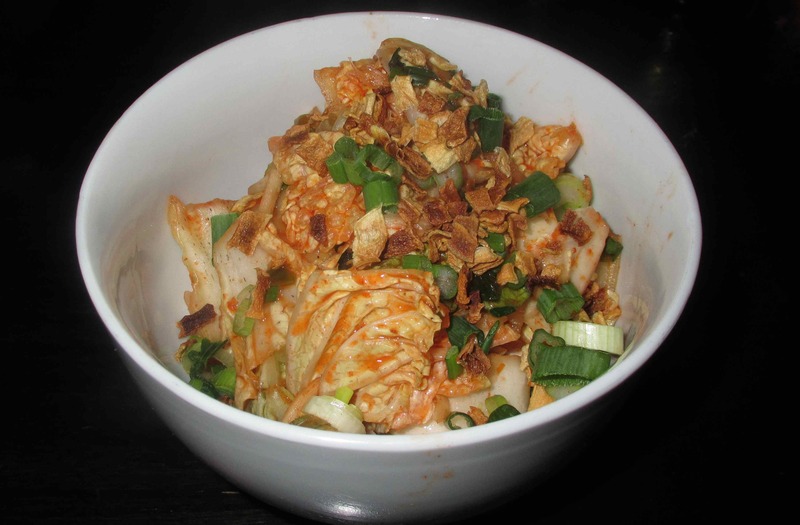 Although made with cabbage, there was only a slightly sour taste suggesting that any fermentation was very brief, and the crisp fried onions and scallion were clearly added merely as garnish not long before service. Basically, it tasted like a fresh cabbage salad in a spicy chili paste and, while it was quite nice, it was not what I expected. I rated it at a 3 out of 5. 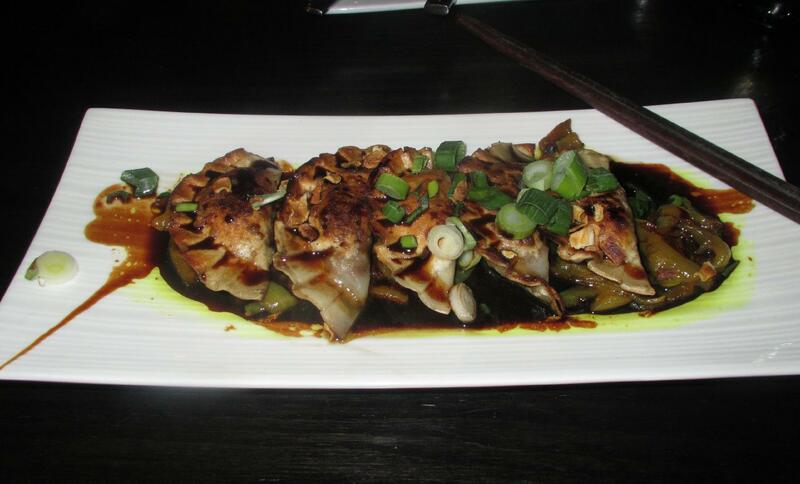 Short Rib Gyoza – These were described in the menu as being served with an onion confit and a Balsamic-Teriyaki redux. Although quite nicely presented (despite the unfortunate inky-darkness of the sauce) I thought the effort was not as good as the other dishes. The sauce was a bit too cloying for my taste and the gyoza themselves were inexpertly prepared, with the skin being over-cooked to the point of being like a hard pastry. I also thought that the beef filling was too highly processed leaving it paste like and without much texture. It was, however, nicely seasoned with a mild curry like flavor that worked surprisingly well with the onions. The total effect wasn’t awful, at all, but it needs tweaking, in my opinion. I gave this dish a 2 out of 5. 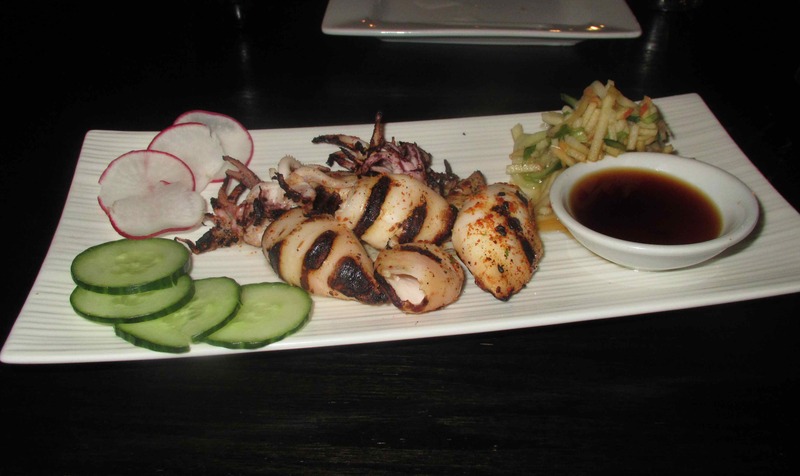 Ika Yaki – This dish consisted of grilled baby squid that came with a ginger-ponzu sauce and an interesting side composed of slivered apple with coriander. I liked the latter, even though I am not a fan of coriander usually, but I found that the ginger-ponzu sauce was non-descript and bland. The baby squid, however, were wonderful and it is a bit of a shame that the bodies were not stuffed as they would have been perfect for some sort of filling. The flesh was nice and tender, while still retaining the right chewy texture, and the grilling was done very well, giving the natural sweetness of the squid a terrific boost from caramelization. I thought this dish rated a 4 out of 5. 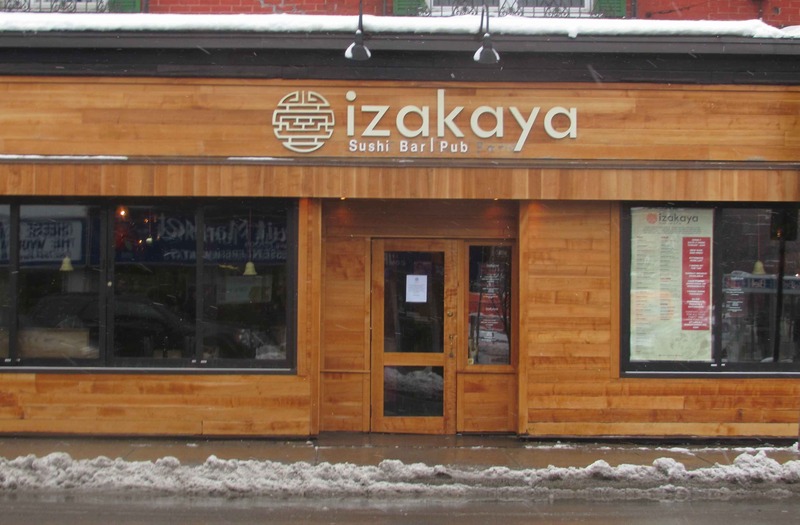 I like the whole idea of Izakaya… the ambience is pleasant, the table service good, and the menu very interesting. In terms of execution, however, I think it must be said that the place needs to mature a little and gain a little polish in its finished dishes. Still, I enjoyed my experience and will return in the future. Overall rating: 3 out of 5. 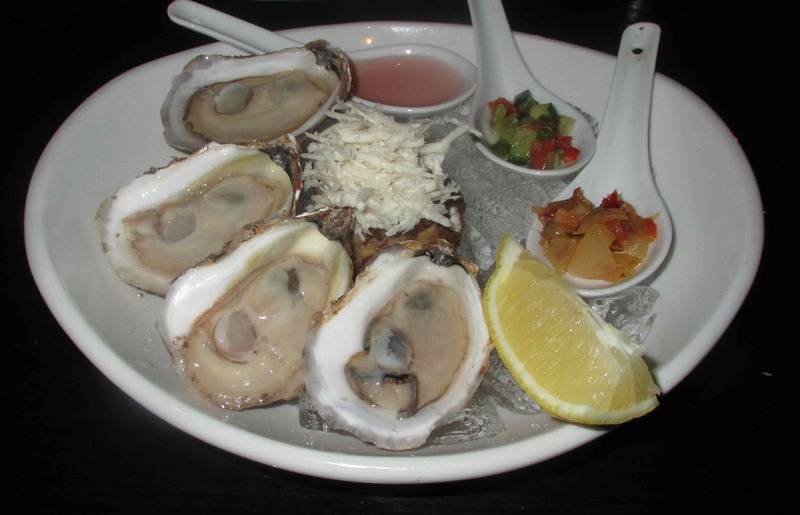 The pix showed that the oysters are not fresh, and the others not too attractive. Is that because of your camera, or the lighting in the restaurant? Rating 3 out of 5 and you still want to go back? Actually, I was having some camera issues that week but the oysters were very fresh. I still want to go back to that place to sample a few other things. Unless service is really bad I don’t usually completely write off a place after a single visit.